The Pelpro Home Heater and Shop heaters come in two sizes and are named by hopper capacity. The '120' holds 120 pounds of pellets, and the '300' holds 300 pounds of pellets. They come into the 'home furnace' category of stoves and are large, square, functional units. The difference between the Home Heaters and the Shop Heaters is solely the window size. In all other respects, these stoves are the same. The Pelpro Home Heater has a viewing window, and the Shop Heater has a tiny window just large enough to check the fire is burning. These stoves have a maximum heat output of 50,000 btu. and are able to heat an area of two thousand square feet. Because of their large hopper capacities, they can burn a long time between refills. 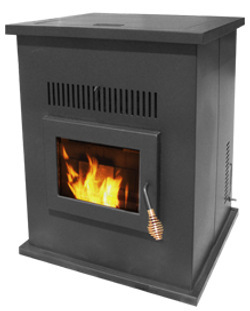 This stove comes thermostat ready and can either be run in high/low or on/off modes. See comments below. There is a shute provided to help in emptying and cleaning out the hopper, which can also be used as a general dust pan. Min. Heat Output 15,000 btu. zero with optional thermostat. See comments below. Hopper Capacity 120 lbs. or 300 lbs. Weight '120', 225 lbs. '300', 272 lbs. Window Size Home Heater, 11 in. by 7.5 in. Shop Heater, 3.5 in. by 2.25 in. Rear Vent Height '120', 8.75 in. '300', 9.25 in. If using an optional thermostat in on/off mode, there are concerns that the life of the igniter may be shortened through increased use.